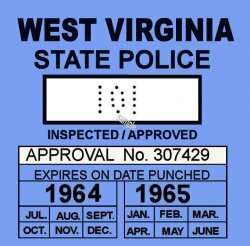 1964-65 West Virginia inspection sticker - $20.00 : Bob Hoyts Classic Inspection Stickers, Add a Final Touch to your Restoration! West Virginia began it's Inspection program in the early 50's as we have so far discovered. We will pay a reasonable price for an original or will provide a FREE, new reproduction sticker for a photo of one, front and back. This 1964-65 West Virginia INSPECTION sticker was carefully restored and reproduced to completely remain faithful in size, front and back, to the original. It has our patented "Peel and Stick" adhesive to place it on your inside windshield like the original. Also for an additional $10.00 we can add an antique license plate number to the front of this sticker where the numbers now appear.